The Daily Racing Form and Bloodhorse websites reported that Santa Anita officials decided late Tuesday (Mar 5) to halt racing while safety consultant Dennis Moore examined the facility. Four-year-old filly Lets Light the Way, trained by Ron McAnally, was euthanised after pulling up with a shattered sesamoid, a bone at the horse’s ankle joint. It’s the 21st horse fatality suffered in racing or training at Santa Anita, outside Los Angeles, since December 26. Daily Racing Form cited Tim Ritvo, chief operating officer of Santa Anita owners The Stronach Group, for the decision to cancel racing. Bloodhorse cited California Thoroughbred Trainers president Jim Cassidy for news of the shutdown. Racing had been set to resume Friday. Cassidy said training on the main track and training track also stopped. Moore, 69, has more than 46 years of experience working with racing surfaces worldwide. He served as Santa Anita track superintendent from 2014 until his retirement at the end of 2018. Earlier Tuesday, another horse was involved in a scare, with nine-year-old Vyjack pulling up following a five-furlong workout. The eight-time winner was taken from the course in a van but later returned to trainer Phil D'Amato’s stable. The California Horse Racing Board said the issue of the Santa Anita fatalities would be addressed by the board following the death of Lets Light the Way. Santa Anita was closed for two days last week after Breeders’ Cup winner Battle of Midway suffered a fatal injury during a workout. A track safety expert from the University of Kentucky was brought in to search for possible irregularities which might explain the spike in fatalities. The course reopened after being given the all clear, only for a 20th fatality to occur with the filly Eskenforadrink breaking down during a race and later being euthanised. Hall of Fame trainer McAnally told Daily Racing Form that the unusually wet weather that has deluged California this year may be responsible for the crisis. The rash of fatalities has led to calls from animal rights activists for the track to be closed for good. People for the Ethical Treatment of Animals called for trainers and veterinarians of horses involved to be investigated. 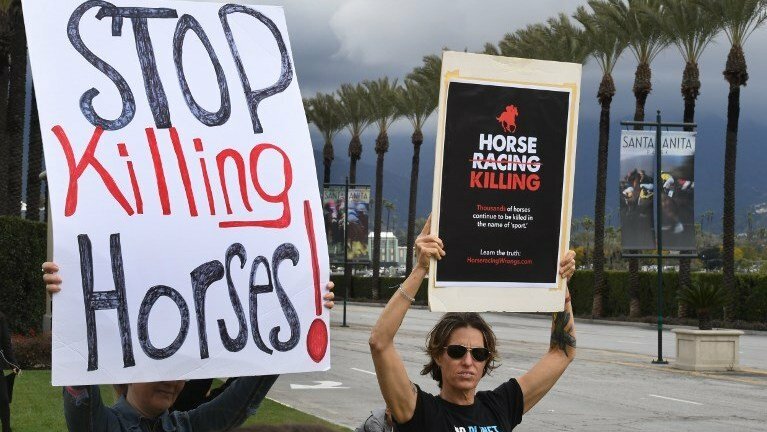 “Twenty dead horses is 20 too many and the only responsible action is for the track to close immediately to stop this spiral of deaths,” PETA senior vice president Kathy Guillermo said in a statement on Sunday. Santa Anita is one of the most famous tracks in US horse racing and will stage the Breeders’ Cup this year from November 1-2. That race track won't close down to long.To much greed and money involved.